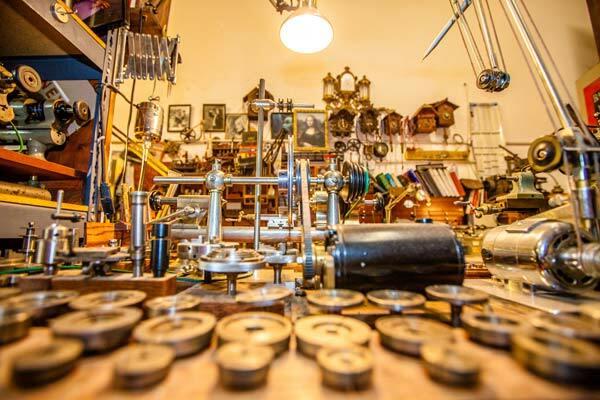 Check out this amazing photo tour of the studio of automaton-maker Thomas Kuntz. In the photos, we see his fantastic sculptures, extensive collection of horological machine tools, and various macabre collections. Each Automata is made in editions of 3 or 4 at most. They breathe,drink, smoke and move- all through clockwork that Thomas creates himself. Every piece from start to finish comes from his wonderfully dark and twisty mind. The complete article can be found the LA Weekly under the title "The Strange Automata Laboratory of Thomas Kuntz @ ARTOMIC Studios".